As a specialist contractor to the Heritage, Arts, Museum and Culture sector, The Hub delivers high quality projects for national and independent organisations, throughout the UK, Europe and the Middle East. With experience in delivering projects from construction to fit-out, we deliver turnkey projects in collaboration with our clients and consultant teams to ensure the expectations of those clients and their visitors are met. The Hub have been honoured to be involved in a number of military themed projects that remember and commemorate those organisations and individuals that have played an important part in our modern history: these include projects at Bletchley Park, the National Army Museum and the International Bomber Command Centre. 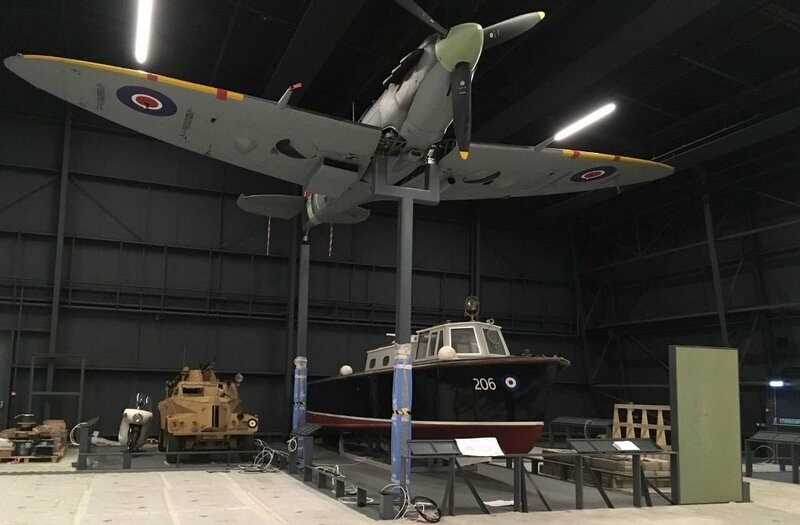 We are equally honoured to be working with the Royal Air Force Museum on the Centenary Transformation Programme and understanding the organisation’s vision, aims and objectives for these three new exciting, informative and engaging exhibitions while also delivering the highest quality, on time and on budget, will be key to their success. All three exhibitions are being installed in hanger spaces that are accessible to staff and visitors of the museums and therefore our quality responses during the competitive tendering process on how we would manage the “live” environment, our specialists and client direct contractors, in the role of Principal Contractor, were critical to our appointment. On appointment we reviewed, with the full client team and their own contractors, the three exhibition concepts delivered by KOSSMAN.DEJONG and MET STUDIO and, working with our specialists, we developed the designs to meet the functional capabilities of the hangers and the project budget. This included for example, our management and co-ordination of audio visual software and hardware suppliers to ensure the visitor experience within the environment, both through sound and vision, is of the highest quality. As Principal Contractor we have a highly skilled management team both on and off-site that I have responsibility for on a day-to-day basis, ensuring tasks are delivered to programme and the client’s expectations are met. I am supported by Phil Wooderson, Director at The Hub, who regularly reviews the project and attends meetings with the client, monitoring progress against programme. Through our “investing in the future” programme The Hub has the facilities to produce all exhibition structures in-house, utilising our skilled workforce, state-of-the-art machining and finishing facilities to deliver a high quality of finish against the specified materials. This includes the co-ordination and assembly of specialist components off-site to ease installation on-site. The exhibitions The First 100 Years (design by MET STUDIO) and Now and the Future (design by KOSSMANN.DEJONG) are currently being installed in Hanger 1. The exhibition Age of Uncertainty (design by KOSSMANN.DEJONG) is being installed in Hanger 6. Each exhibition has its own individual style and approach to delivering the visitor experience. However, to achieve this individuality we have also looked at the standardisation of operational requirements to ensure consistency for the client’s team post practical completion and this approach has delivered standard details that we have applied across all three exhibitions. As we developed the designs to full production drawings we had to take into account various constraints of the hangers such as structural loadings and dimensional information gleaned during our detailed surveys. At no time have we wanted to compromise the visitor experience and a process of change management has ensured that the highest quality of finish has been retained while meeting the challenges these constraints gave us. Production drawings and supporting items such as prototypes, mock-ups and samples had to be carefully programmed to ensure that they met the required off-site manufacturing and on-site installation phases. Due to the scale of the exhibitions, metal is a material that has been incorporated throughout Hanger 1 for both aesthetics and as a structural requirement to support the interpretative media. In the First One Hundred Years exhibition metal barriers are connected seamlessly with the armatures that support the large artefacts at high level. These barriers provide a sensitive divide between the visitor and collection. These barriers not only divide, they support interpretative media and distribute power and data. For the Now and the Future Gallery we worked with a contractor that specialises in industrial gantries to deliver the main interpretative spine. The scale of this structure required alterations to the floor and an installation methodology to allow its safe erection in the narrowest part of Hanger 1. 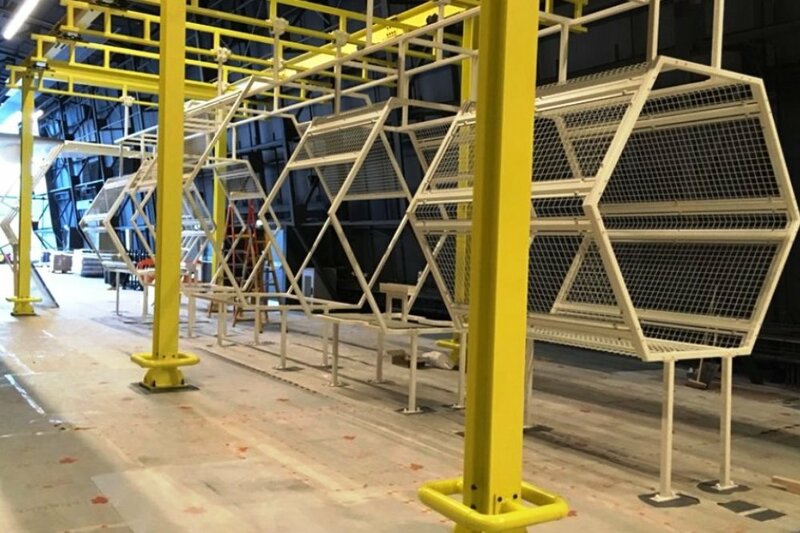 We established site in Hanger 1 during late December 2017 providing access to the base-build contractor to allow their final testing and commissioning to be completed. Since January 2018 the installation of the exhibitions has been ongoing, commencing with structural works to support a number of exhibition structures closely followed by the installation of large artefacts at low and high level. This phase of the project has required detailed programming and coordination between the client, their contractors and volunteers to ensure the protection of the artefacts and personnel throughout the installation process, particularly as large exhibition structures including the Now and the Future gantry and the “First One Hundred Years” projection structures were installed in parallel with these operations. 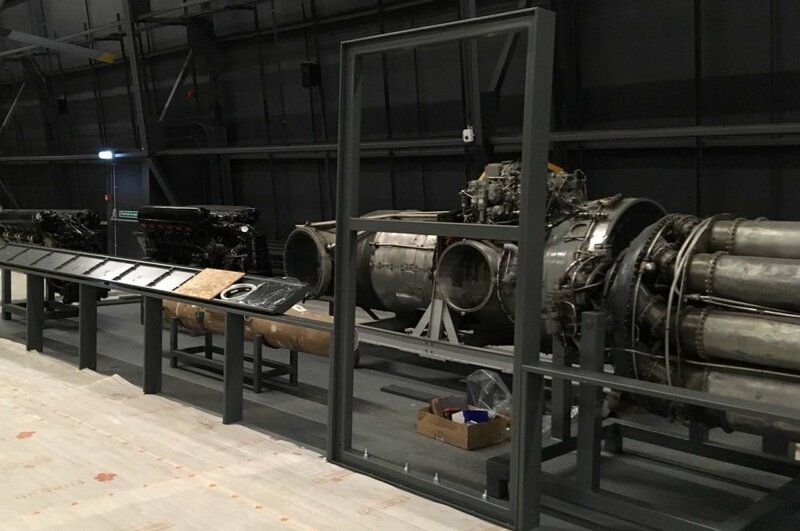 Works in Hanger 6 commenced in March 2018 with the application of new floor finishes which once again had to be coordinated with large artefact movement and installation. We have now completed our first fix in both hangers and we have more than 19 operatives on site covering seven work packages who are installing, among other things, the exhibition structures, audio visual hardware, interactives and graphics. 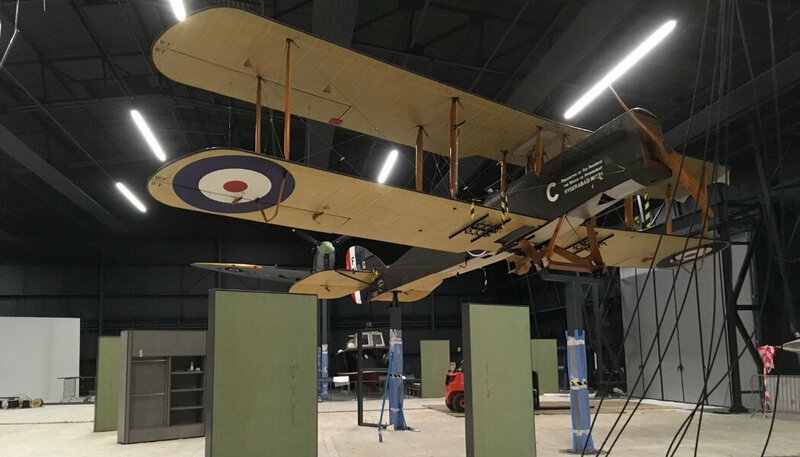 We were asked by the Royal Air Force Museum to expedite works at Royal Air Force Museum Cosford to meet the RAF Centenary date of 1st April 2018. This small exhibition utilises components from the The First 100 Years (design by MET STUDIO) and provides an introduction to relevant collections around the museum. Prior to installing the exhibition we had to make the space fit for purpose which included a full strip out and the installation of new ceilings, floors, electrical installations and full decorations. With the three exhibitions at the Royal Air Force Museum Hendon opening fully to the general public in the summer of 2018, the whole team at The Hub and our specialists are honoured to be delivering these exciting, informative and engaging exhibitions which commemorate and celebrate the past, present and future of the Royal Air Force. This case study is part of a feature Marking 100 years in style: The RAF Museum’s Centenary Transformation Programme.